Just before Christmas I spent a few days on the road reccying the route for the new Rapha Randonnée Weekend Catalonia – a three day riding trip taking in many of the roads and climbs used by the several pro riders who make their home in Girona. Our idea behind the Randonnée Weekends is to offer three days of great riding close to good transport links for easy travel and slightly less demanding riding than a big sportive or full Randonnée so prospective riders weren’t so worried about fitness levels. We landed in Barcelona and after picking up the hire car, we’re soon on the motorway north towards Girona. The last time I had visited Girona was at the end of a challenging Pyreneen Raid where I had been carrying all my own gear and saw us ride the last couple of days into Girona in 35C+ August heat. Needless to say my memories were slightly tarnished by this experience. More positive memories were of Girona’s charming old town and numerous plazas, perfect for tapas and a glass of vino tinto. The route for the first day’s riding would see us head west out of Girona and into the undulating hills that slowly rise up to meet the Southern extent of the Catalonian Pyrenees. The traffic of downtown Girona melts away as the route heads for the hill towns of Osor and Sant Hilari Sacalm. As we climbed away from Girona the late Autumn sunshine was diffused and filtered through the bare trees as the road wound its way up a narrow valley. Once in this hill country, the bustle of Girona is long gone and the pace of life seems to slow down a couple of notches. We enjoyed a brief stop in Viladrau, a charming, sleepy village with a couple of welcoming cafes. Seemed like a good lunch stop for the riders. Descending out of Viladrau, an amazing view of the mountains of the Montseny National Park opens up on our right hand side. Soon enough the road is climbing for the final time as we meander through evergreen forest on the way to the final destination in Sant Julia de Vilatorta. One final descent takes us through an avenue of plain trees and into the town. It was a cold, grey start to our reccy of the second stage. The freezing fog pervaded the valley and seemed to chill to the bone. As we climbed up and away from Vic, the fog suddenly began to clear and we were rewarded with an amazing view back from where we’d come and shafts of warm Autumn sunshine on the back of the neck. Day Two is the toughest of the three. It starts with undulations through rolling farmland before some tougher climbing after lunch. Most of the route takes in tiny roads with virtually no traffic – no wonder the pros love this place. We’re back to civilisation briefly as we navigate the narrow streets of Ripoll and straight onto the twin climbs of Coll de Canes and Coll de Coubet. In typical Spanish Pyreneen style, the climbs are well surfaced and nicely graded; no steep pitches here to shock the legs (that comes later!). The descent to Sant Joan is a treat, the perfect combination of tight hairpins, flowing corners and exhilarating straights. A first glimpse of the Southern Pyrenees towering above Sant Joan provides an amazing backdrop. After a quick snack in Sant Joan, I was keen to reccy my chosen route north into the mountains. Marked on my maps as little more than a single black line, I was slightly apprehensive whether it could be traversed on a road bike. A quick chat with our barman reassured me that this fitting finale to the ride was possible. After crossing the El Ter river via a beautiful single span bridge, we immediately started climbing. This was tough – my Garmin was reading 15% in places as we quickly climbed high above Sant Joan. The gradient eased slightly but we continued to climb as an amazing view back towards Barcelona opened up to our right. We were truly in the wilds now as birds of prey soared on afternoon thermals overhead and chamois scurried for cover. It was a real treat to discover the road and I can’t wait for guests to experience it as well in May. Upon reaching the end of the range, a rapid decent brought us down into Camprodon, leaving just a few kilometres to the overnight stay in Llanars. Despite the descent we were still at 1000m with the temperature gauge close to freezing as the sun began to set. Luckily we were soon in the warmth of Hotel Grevol in Llanars, a traditional ski lodge with cosy wood panelling and a welcoming log fire in the bar. We treated ourselves in the spa (something I’m sure the riders will enjoy) and enjoyed a great meal in the hotel restaurant. After a wintry start we were soon on familiar roads from my previous cycling trip to Catalonia. 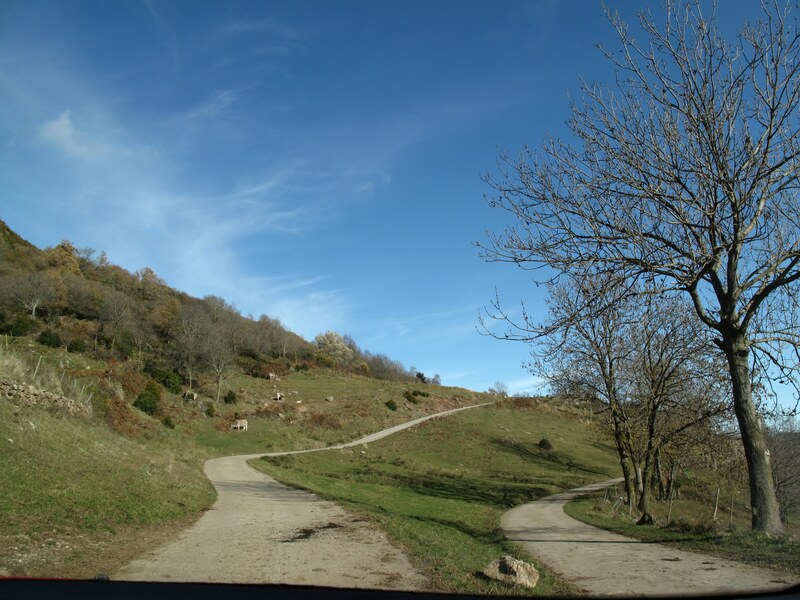 The road between Castell de Rocabruna and Castelfollit de la Roca is one of my favourites. You start by losing some of that 1000m altitude in a series of sinuous hairpins heading for the bottom of a steep sided, wooded valley, past the charming village of Beget with its stunning Roman church and narrow cobbled streets. 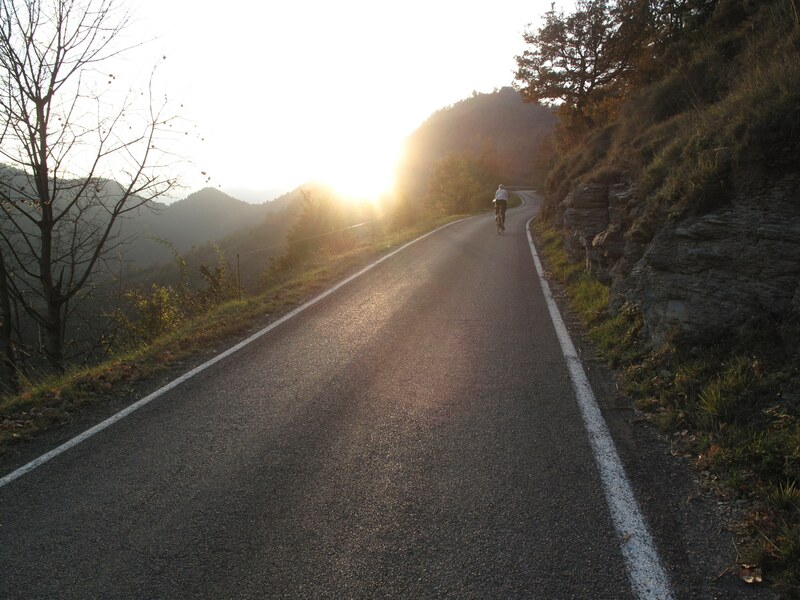 A couple of stiff climbs stand in the way of some flatter roads around Olot. There’s some busier roads through Olot to negotiate before we enter the beautiful Garrotxa National Park which features 40 volcanic cones and 28 lava flows apparently. Luckily for us, this volcanic activity ceased a while ago so our passage to Girona is unaffected. The general trend for day three is descending, heading from the highlands at Llanars back to Girona. The exception to this trend is encountered as we leave the Garrotxa Volcanic Park and head to Banyoles. Rocacorba. 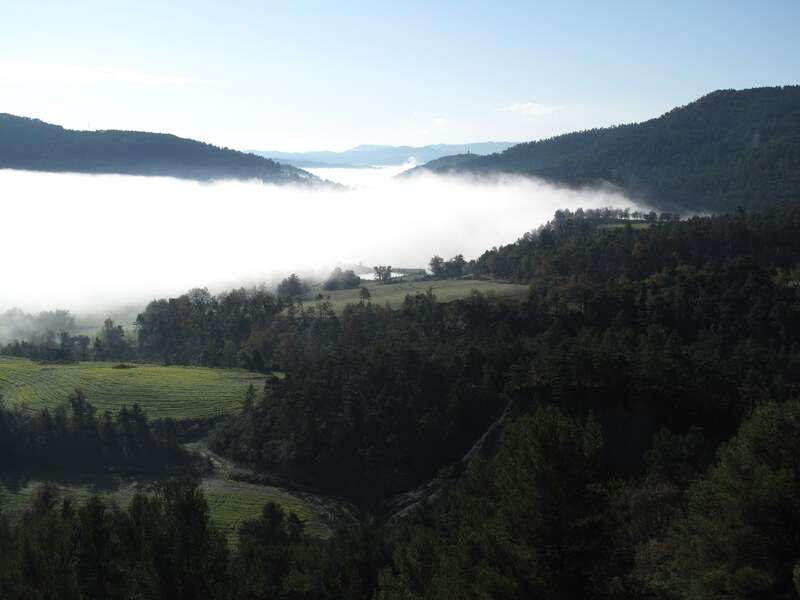 A name that crops up with regularity in the blogs of Girona based pros such as David Millar and Michael Barry, Rocacorba is a 14km climb rising to almost 1000m above Banyoles and commanding impressive views towards Girona and beyond. It’s a tough but fitting way to end the trip. The climb starts unremarkably with a nice, steady 5% gradient to get you in the groove. Don’t get complacent though, this climb gets incredibly tough in places notably the 10%+ sections around half way and the savage final pitches to the summit. Unfortunately there’s nothing much more than a radio mast and hang gliding launch point at the summit so it’s back the way we came for a final blast back in Girona. Sounds divine!!!! Have not yet cycled Catalonia. Can’t wait til March – going back for 2 weeks of cycling in Mallorca – will be a dream!